At around 3 months old my son had his first sleep regression and I was starting to go crazy from sleep deprivation. I also got sick, my milk production dropped and we had to start supplementing with formula. So let’s just say I got a little desperate during the middle of the night wake up sessions that were occuring every 2 hours (if I was lucky) and I ran google search after google search looking for solutions. Here are a few tricks and products that really helped me get through these tough times as well as some of the earlier months. This was my favorite item out of anything else we used (besides maybe the swing). As my dad called it, the baby straight jacket, must have earned us hundreds of extra hours of sleep. It took a little while for my baby to get used to it but once he did he couldn’t sleep without it. So you can imagine my fear once he was beginning to roll over (which is when you have to phase them out of it) but that is a story for another time. If you are looking for a good baby shower gift or a new mom desperate for some sleep, give these a shot. They are not crazy expensive and are totally worth every penny. I know some people who have said they did not work for their baby but I pray for your sleep that it does! Read this review on 5 of the best swaddles on the market! The Dock-A-Tot was a purchase made in a moment of complete desperation. I hadn’t had more than 2 straight hours of sleep in about a week and I would have paid almost anything to get more sleep. So while these gadgets are not cheap by any means, if you have a fussy baby who likes to be snuggled, this thing will out help significantly. If funds are an issue you can always try to find it on Craigslist or Facebook Marketplace, people are always trying to sell their old baby stuff and it should be quite a bit cheaper. One of the greatest features about this item was its ability to travel everywhere with us. It came in a nice plastic protective bag and it has handles on the item itself. We were in the middle of moving out of one house, across the country and into a new house when my son was 5 months old and this item was irreplaceable. We used it everywhere and for everything, even diaper changes or just a comfy spot to put him down in! for him, having already exhausted everything that had worked in the past. The second, and I mean quite literally the very second I set him down in this thing he fell asleep. It was like a switch was turned off and my red faced, puffy eyed screaming baby’s face suddenly went slack and peaceful, his sweet little chest rising up and down. I tiptoed out of the bedroom and collapsed on the couch with a huge sigh of relief. It’s not every day that a product you take a chance on works so completely and so quickly. It is a similar product to the DockATot and we used it at the same time and in the same capacity as the DockATot, but rather than babies being meant to completely fit inside of it, they can grow in this one until their legs hang out over the bottom edge. These are also a little bit cheaper than the DockATot but not quite as easy to travel with. They have a cover just like the DockATot that can come off and be cleaned which is important since babies are still in the prime spit up phase when these products come in handy. 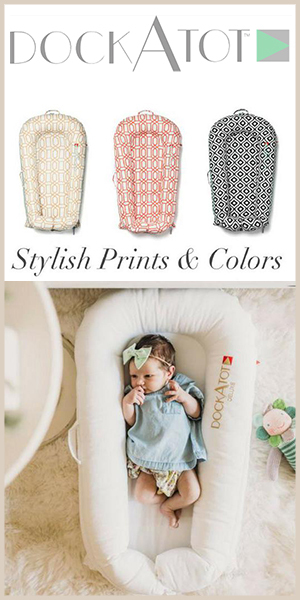 Whether you choose to use the DockATot or the Snuggle me is purely a matter of preference in my opinion. k to it almost immediately, giving everyone a little break. From the many many reviews I read about the Mamaroo, it seemed that babies either loved it or hated it. The motion is softer and more fluid than some other swings apparently, so babies who wanted a lot of motion were not happy campers. One of my main reasons for ending up with the Mamaroo was the footprint, it took up a lot less space in our small house than some of the tri-legged swings you will see on the market. For those of you wishing and hoping to get your child to sleep in their own space, I hear ya! But also I want to say, savor it. Once my son started sleeping in his crib I realized how much I missed having him with me or near me. The more restful nights of sleep though are not a huge downfall. They change so fast and I still have so much more to learn about being a Mom but I am trying my hardest to enjoy all the moments as they come. Yes even the crappy ones (literally)! And remember, this too shall pass. That was the motto that helped me get through some of the toughest nights! I did the website all myself, thank you!